Split up and prepare our Pudding-Banana Split recipe! 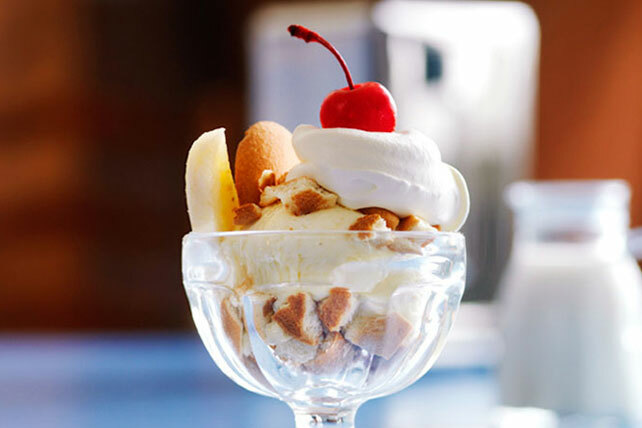 Everyone will love the creamy frozen pudding texture of the result of this banana split recipe. Beat pudding mix and milk in large bowl with whisk 2 min. Stir in 1-1/2 cups COOL WHIP; spread onto bottom of 8-inch square pan. Freeze 3 hours or until firm enough to scoop. Chop 16 wafers. Spoon scant tablespoonful of the chopped wafers into each of 8 parfait glasses or dessert dishes. Scoop 1/4 cup of the pudding mixture into each glass; sprinkle with remaining chopped wafers. Cut bananas lengthwise in half, then cut each piece crosswise in half. Stand 1 banana piece in each parfait glass. Fill with remaining COOL WHIP and wafers; top with cherries. Save 50 calories and 3g of fat, including 1.5g of sat fat, per serving by preparing with fat-free milk, 1 pkg. (1 oz.) JELL-O Vanilla Flavor Sugar Free Fat Free Instant Pudding, COOL WHIP LITE Whipped Topping and reduced-fat vanilla wafers. Let frozen pudding mixture stand at room temperature about 5 min. before scooping to soften slightly. Top with your favorite flavored ice cream toppings, JET-PUFFED Marshmallow Creme and/or colored sprinkles.